The most prominent downstream targets of Rac and Cdc42 in blot overlays are the mammalian p21-activated kinases (PAKs)  with homologs Ste20 and Cla4 in Saccharomyces cerevisiae; these proteins have been implicated in cell-cycle control, dynamics of the actin cytoskeleton, apoptosis, and transcription (for reviews, see Bagrodia and Cerione ). 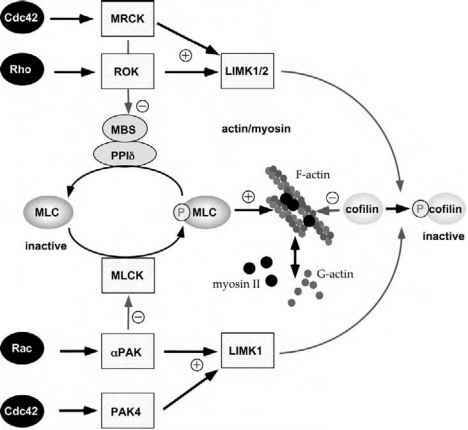 One of the effects of PAK expression is a loss of F-actin; this is thought to result in part from effects on myosin light chain kinase (MLCK; see Fig. 1). However, an opposite effect is thought to result from activation of LIM kinases; cofilin inactivation by LIM kinases facilitates the assembly of actin. LIM kinase 1 is activated by Rac1  and its effector, PAK1/aPAK . It has recently been shown that the related Cdc42 effector PAK4 is a potent in vivo activator of LIM kinase 1 . In spite of the close connection between Rho GTPases and focal adhesion complexes, PAKs are the only identified effector (kinase or otherwise) that have been localized to adhesion complexes , where PAK is probably locally activated in these fledgling structures . 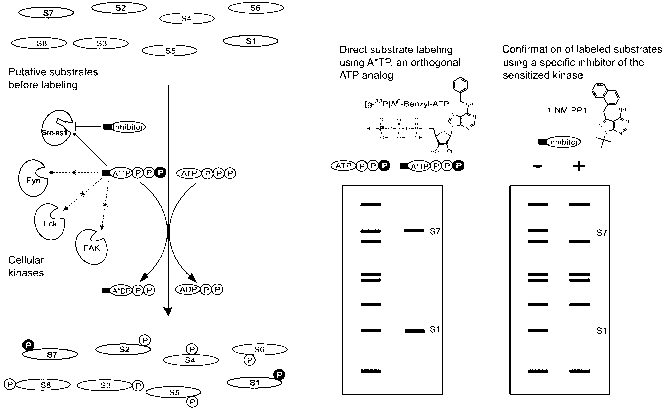 Figure 1 Pathways linking Rho GTPase-associated kinases to actin/myosin II. Rho regulation of actin organization occurs through multiple effectors. The Rho-associated kinase (ROK) and the myotonin-related Cdc42-binding kinase (MRCK) block protein phosphatase delta (PP18) activity by phosphory-lating the myosin binding subunit (MBS) p85 or p130 subunits. This prevents inactivation of phosphorylated MLC-P assembled into actin stress fibers. Myosin-II-driven assembly of stress fibers favors the formation of focal adhesion complexes. Myosin light chain kinase (MLCK) is a key enzyme for maintaining the myosin heavy chain-light chain complex in an active state but is negatively regulated by Rac via the p21-activated kinase (PAK). It appears that both Cdc42-binding kinases PAK4 and MRCK can act via LIM-kinases (LIMKs) to inactivate cofilin. This stabilizes actin filaments, because cofilin serves to accelerate actin dissociation and may drive the net peripheral actin assembly characteristic of active Cdc42. binding domain (PBD) and a flanking kinase inhibitory domain (KID) that maintain the C-terminal kinase domain in an inactive state (Fig. 2). The ability of the PBD to bind with high affinity to Cdc42 GTP and Rac GTP forms the basis for biochemical pull-down assays of the active GTPase species. Mutations in the KID lead to constitutive activation of PAK in the absence of GTPase . The binding of Cdc42 GTP or Rac GTP was proposed to allosterically induce activation of the kinase by affecting the KID structure . The structures of an autoinhibited PAK  and of complexes between Cdc42 and a CRIB-containing fragment  seem to support the model. Cdc42-GppNHp binds with low affinity (Kd «0.6 ||M) to intact kinase, whereas the affinity to the isolated regulatory fragment is much higher (Kd 18 nM), indicating that the difference in binding energy is used for the conformational change leading to activation . 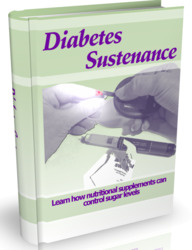 PAKs can also be activated by lipids, including sphingo-sine , which may act synergistically with Cdc42 . Proteolytic digestion of aPAK produces a heterodimeric complex consisting of a regulatory fragment (residues 57 to 200) and a catalytic fragment (residues 201 to 491), which is active in the absence of Cdc42 . In the physiological context, this is relevant as PAK2 is caspase activated . 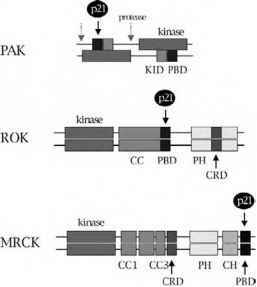 Figure 2 Structural features of Rho GTPase-regulated kinases PAK, MRCK, and ROK. These proteins have in common a p21-binding domain (PBD), which interacts with only the GTP-bound form of the p21, and a catalytic serine/threonine kinase domain. All three kinases exist as dimers in the cell (as illustrated). While PAK is autoinhibited in a head-to-tail fashion, ROK and MRCK are thought to be aligned in parallel. The kinase inhibitory domain (KID) of PAK is a conserved motif that makes numerous contacts with the catalytic domain in the crystal structure . Structures are not available for the other two kinases, which are dimerized via their coiled-coil domains. Abbreviations: PH, pleckstrin homology; CRD, cysteine-rich domain; CC, coiled-coil; CH, citron homology. is involved in activation. Although Parrini et al. propose that Cdc42-binding dissociates PAK1 dimers, different results are seen with PAK/Cdc42 complexes on gel filtration columns . Here, the data suggest that an allosteric control mechanism induces autophosphorylation, which in turn induces the release of the KID and full kinase activation. This finding is contrary to the view that phosphorylation is a late event in the p21-mediated activation mechanism and serves primarily to stabilize the open conformation. The complexity of the PAK activation mechanism requires further analysis.